This small 16-18 passenger luxury limo bus is the perfect option for groups wanting to travel together for weddings, corporate events, stags, Vancouver airport (YVR), cross border shopping and trips to Whistler. A sleek black exterior with tinted windows keeps everything cool and private. This smaller limo bus means you don’t have to pay for used space, making this one of the most affordable private transportation options. The interior is fitted with state-of-the-art entertainment and lighting features that are easily controlled from the passenger cabin area so you are always in full control of your limo bus experience. Leather seating, custom sound system, climate controls, custom bar area, flatscreen TV’s, i-pod connectivity and speciality interior lighting that syncs with the music. You and your guests control everything while you travel with Ritz Limousines. 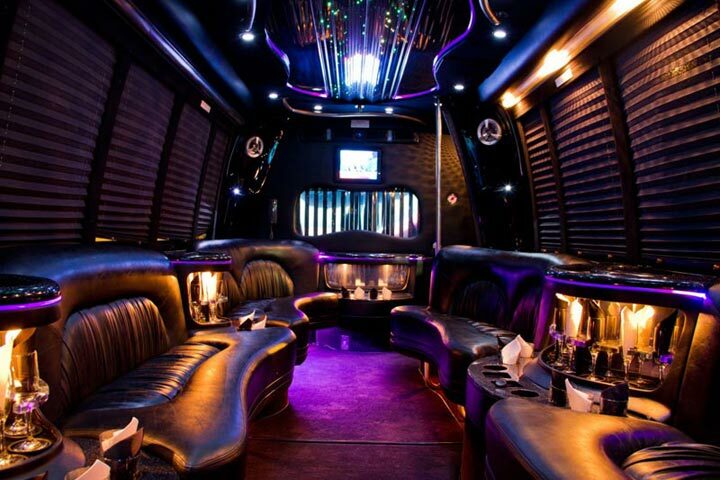 This luxury limo bus is configured perfectly for 16-18 passengers with lounge style seating. Interested in booking our 16-18 passenger limo bus for your next event? Please feel free to call our office or email anytime. Ritz service representatives are standing by and always happy to answer questions about our limo bus services or offer information to help you plan a perfect wedding, airport service, whistler adventure, tour, stag party or special event.